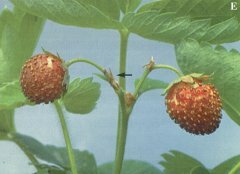 Bronzing of strawberry fruit (Figures A and B) is a common problem for producers causing significant losses some seasons. The symptoms first appear when the king fruit reach 5 to 10 mm in diameter. Close inspection of the fruit will reveal a necrotic flecking or bronzing of the seeds and fruit, particularly at the base where they are covered by the hull (Figure Q. The inner surface of the hull may show a brown or grey discolouration (Egure D). Flecking may become so extensive that the entire fruit appears bronzed, sometimes accompanied by cracking (Figure E). Most damage occurs during the period when the fruit expands from 10 to 20 mm. As the fruit ripens and colour develops, the bronzing becomes less evident. Affected fruit, however, appear dull and lack the glossy shine of undamaged fruit (Figure F). Severely bronzed fruit are soft and the seeds are more prominent. Losses to the producer occur because of reduced marketability of the fruit due to poor fruit quality. The amount of loss is determined by the quality standards of the market, and by the incidence and degree of bronzing in the crop. Leaves of affected plants do not show any damage, but small leaves on the flower stalks may be necrotic (Figure E). Most, but not all fruit bronzing is caused by the feeding of the flower thrips (Frankliniella tfiticil) on immature fruit. 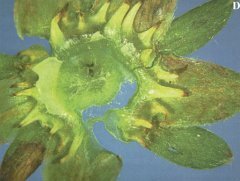 Thrips begin feeding on the seeds and the inner surface of the hull soon after the buds open. As the fruit expands and the seeds separate the thrips feed extensively on the fruit between the seeds. 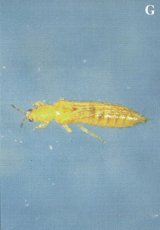 Thrips feed by piercing the surface cells with their mouth parts and sucking the contents. This causes these individual cells to die and, with continued feeding, the entire fruit becomes bronzed. This scar tissue does not have the elasticity of healthy cells and cracks develop as the fruit expands. 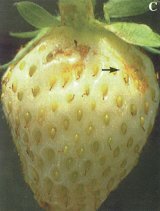 Initially, thrips tend to remain on individual fruit stalks and plants, which can result in severely bronzed fruit and unaffected fi-uit in the same area. 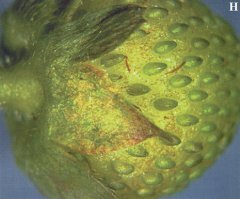 As infested fruit ripens, or becomes heavily bronzed, the thrips migrate to other fruit and, with large infestations all fruit in a field may show some feeding damage. Nymphs and winged adults can both be found feeding on strawberry fruit although adults are less common. Nymphs are translucent when immature, changing to cream and finally to a distinct yellow colour with dark red eyes in the later stages. Adult thrips (Hgure G) reach 1.5 mm in length and can often be found on weeds such as hempnettle, toadflax and vetch if they are in flower in the strawberry field. In a severely infested field, 100 percent of the crop may be affected, however, fruit which is only slightly bronzed remains marketable. This is because the bronzing becomes less evident as colour develops and also because of a high consumer acceptance at UPicks for this type of fruit blemish. Standards for wholesale are more demanding and losses can be greater. At harvest, varieties which have dark red fruit usually show less bronzing. It is not known if flower thrips overwinter in this area. Each spring, adult thrips are carried here in great numbers on air currents from the south. They are attracted to white flowers and therefore to strawberry bloom, although, they will feed on most crop plants, weeds and trees. 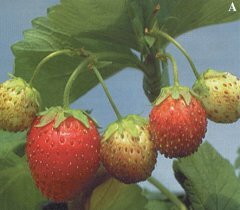 No economic threshold has been established for control of flower thrips on strawberry. Past experience has shown that when the number of thrips exceeds two per fruit at the early fruit maturity stage, then the amount of unmarketable fruit can exceed 20 percent. For U-Pick operations we are suggesting that at the early fruit maturity stage there should not be more than 25 thrips per 50 fruit. For more stringent quality standards, the number of thrips should not exceed five per 50 fruit. Direct monitoring of the number of thrips is difficult due to their small size. For this reason it is recommended that producers collect a random sample of 50 fruit per 0.5 hectares when the first fruit are 5 to 10 mm in diameter. A specific spray for thrips control is warranted for U-Pick operations if five or more fruit are bronzed. For more stringent quality standards, reduce the allowable number of bronzed fruit to one per 50 fruit. At that time, thrips are located principally in the protected area under the hull, therefore, good control can only be achieved with a high volume spray delivered at high pressure. Do not commence harvesting until the minimum preharvest interval has been observed. Insecticides applied for control of other pests such as strawberry bud weevil and tarnished plant bug may also help suppress thrips. Fruit bronzing can also be caused by the feeding of mites, particularly the two-spotted spider mite. 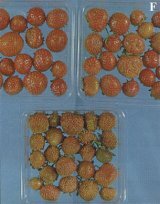 Ten or more mites per fruit, however, are required to produce visible bronzing. The type of bronzing caused by mites is similar to that caused by thrips, but differs in that the flecking or bronzing pattern is more random and less reticulate fture H). The damage caused by mites can easily be differentiated from that caused by thrips by the presence of mites and by the typical feeding damage caused by mites on the outer surface of the hull and on the leaves. Cyclamen (strawberry) mites may also cause bronzing if present in large enough numbers on the fruit. At this level of infestation, however, the leaf distortion which is symptomatic of cyclamen mite infestation is clearly evident. It is not unusual to find both thrips and mites together on the same fruit, although fruit collected as it nears harvest may not have thrips present, since they tend to migrate from ripening fruit. 1 Identification by Eric Maw, Centre for Land Biological Resource Research, Biological Resource Division. Figures A: Four small fruit with typical bronzing. Largest ripe fruit with little visible damage. 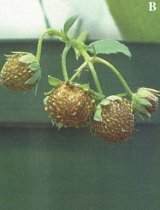 B: Severely bronzed fruit resulting from an infestation of seven thrips per fruit. C: Bronzing of fruit in the area protected by the hull. D: Discolouration of inner side of hull. E: Severely bronzed fruit with cracking, note necrosis of stalk bracts. F: Three levels of bronzing, note the progressive loss of shine with the development of bronzing. G: Adult thrips (Frankliniella tritici). H: Bronzing caused by two-spotted spider mites. Note typical feeding damage on outer side of hull.